Discrimination continues to affect the lives of millions of people infected or affected by HIV/AIDS, around the world. They are often cut off from their families, fired from jobs, isolated in hospitals, or left unemployed — simply on account of their health status. Fear of being abandonment is a primary reason why people are less likely to test for HIV, disclose their HIV status to others, and adapt HIV preventive behavior, and access treatment, care and support. World Aids Day, commemorated on the first of December every year, is an opportunity to unite in the fight against HIV stigma and discrimination, show support and solidarity for those living with HIV. This year on World AIDS Day, CCDT’s Home-Based Care Program launched an innovative campaign to spread awareness on the discrimination faced by HIV infected/affected people. 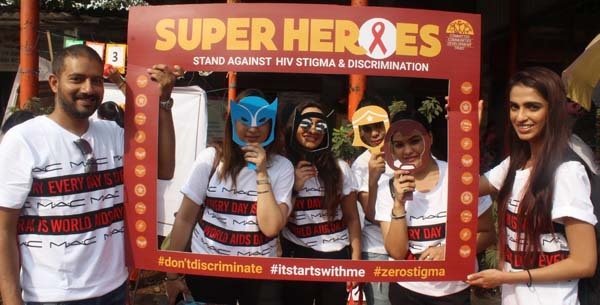 By setting up superhero selfie-points at colleges and railway stations across the city, CCDT brought to light prevalent social perceptions that fuel stigma and discrimination against people living with HIV. The Home-Based Care program team interacted with people at these various kiosks and selfie-points to alter social perceptions of HIV and reduce stigma. Volunteers from MAC AIDS Fund (MAF) joined the campaign on World AIDS Day. People commit to standing against stigma and discrimination by signing a banner titled, ‘I will not discriminate against HIV infected people’.